UPDATE: Six months extension for 'phones' has been applied now and the last OS patch for Anniversary Update will be in October 2018 after all. See newer News stories for updated charts. Now that the Fall Creators Update ('rs3', i.e. 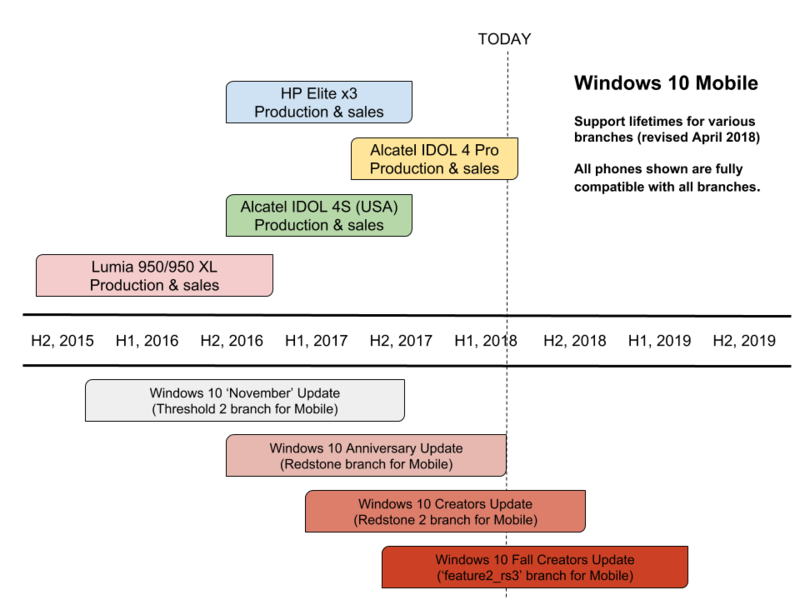 'Redstone 3', at least in name) is the 'production' branch of Windows 10 Mobile, we are seeing 'Patch Tuesday' fix round-ups for it too, with the official list for 15254.369, the 'April 2018' update' mainly composed of minor fixes and security patches, at least in terms of mobile relevance. An update to the Windows Update client to improve reliability. As usual and as per the graphic above (the rectangles in a shade of red), all other supported Windows 10 Mobile branches are getting updates too, so all those older phones (Lumia 930, 830, 735, 640, etc.) finishing life on the Anniversary or Creators Update (if the user was smart enough to use our (ahem) hack!) aren't losing out on the core security fixes, at least. Phones on the Anniversary Update should advance to 14393.2189 (from .2125). In each case you get the core security and component updates, though obviously without any subtleties in functionality introduced in later branches. Note that for any phones left behind on Anniversary Update (why, why? Use our hack if you're techy enough! ), this is the last ever official monthly patch/update. Note the effective (in terms of new builds) termination of the Insiders programme, so we're only dealing with these 'Patch Tuesday' updates from now on. Besides the lack of development of new features, Insider builds for Mobile are just not worth bothering with for Microsoft, since the changes from month to month are small enough (and common enough to Desktop) to just be tested internally.